The Runnin Royals dug out of a surprising early hole before using free throws to ice their sixth straight win over rival Bridgewater, a 77-67 decision Wednesday night in Harrisonburg. Eastern Mennonite’s men have now won 11 of their last 12 meetings with their rivals. The two teams will meet again in Bridgewater on Feb. 18, the second-to-last game of the regular season. The visiting Eagles made a quick start, with big man Logan Seacrist hitting a pair of three pointers and All-ODAC forward Ed Reddick putting in nine points on the way to a 25-10 lead at the 9:08 mark. EMU then scored on their next five possessions to trim a few points off the deficit, and the men caught fire over the final minutes of the half. James Williams (Capitol Heights, Md./Archbishop Carroll) connected on a pair of free throws with 2:45 remaining which triggered a 7-2 run. The Royals were within 35-29 at halftime and the late surge carried over into the second. Over the opening 1:29 of the final frame, EMU made three shots while Bridgewater was saddled with two turnovers and a missed jumper. Jerome Jones (Charles Town, W.V./Washington) drilled a triple to cap the 7-0 spurt, giving Eastern Mennonite their first lead of the night at 36-35. It also highlighted a massive 26-10 swing, erasing BC’s early lead. The edge stayed around two or three possessions until a prolonged 8-0 run by Bridgewater flipped the visitors back in front, 53-51 with 7:26 to play. The teams traded leads for the next two minutes until two free throws from BC put them on top 60-58 with 4:58 left. A massive alley-oop dunk then signaled the beginning of the end for the Eagles. On EMU’s next possession, Williams drove into the lane and drew a double team. He floated a high pass which David Falk (Madison, Va./Madison County) threw down to erupt the home crowd and start a decisive 11-0 run. Over the next 2:22, each of EMU’s five starters scored in the paint, while Bridgewater came up empty. Finally with 1:17 remaining, Williams made a free throw to end the run, giving the men a commanding 69-60 lead. The Eagles turned to fouling, but the Royals were up to the task. The men sank all eight of their attempts from the stripe over the final 48 seconds to win by their biggest margin of the night, 77-67. 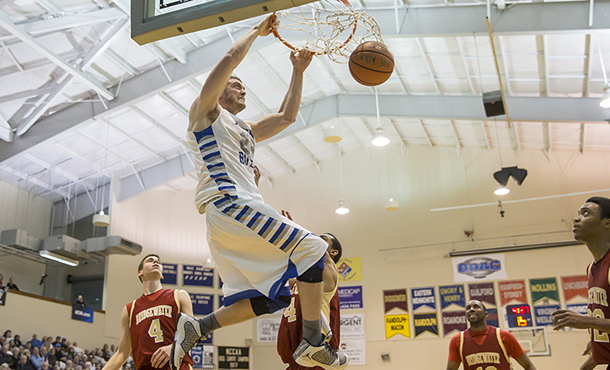 Eastern Mennonite dominated the second half, shooting 48 percent to BC’s 31 percent to out-score their rivals 48-32. For the game they had a 40-to-37 percent shooting edge and won the battle of the boards, 48-41. All five of EMU’s starters scored in double figures, as they were good for 74 of the team’s 77 points. Marcel Crump (Richmond, Va./Highland Springs) had a team high 17 points and was 7-7 from the free throw line. Falk charted another double double with 18 rebounds (including eight offensive), 14 points and three blocks. Williams and Ryan Yates (Alexandria, Va./T.C. Williams) each scored 15 points, while Jones tallied 13. BC’s Reddick finished with 24 points, 11 rebounds and a game high four assists. Seacrist came in with 12 points and Kyle Welty knocked in 11. Eastern Mennonite improves to 10-4 with the win while Bridgewater slides to 8-6. Both teams are now 3-2 in the ODAC. The Royals are on the road this Saturday, playing at Hampden-Sydney at 2 p.m.